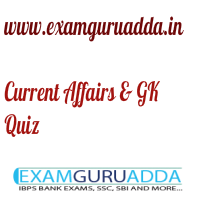 Dear Readers Examguruadda.in presents Current Affairs quiz of 7-8th January 2017 that cover important current affair events. Current Affairs quiz for IBPS PO,clerk, RRB-Po,Clerk, SBI, NIACL,Railways and SSC Exams. 1. Who become first batsmen that score centuries in 11 countries? 2. The 14th edition of Pravasi Bhartiya Divas (PBD) began at which place? 3. Who is the chief guest of 14th edition of Pravasi Bhartiya Divas (PBD)? 4. According to Central Statistics Office (CSO), India’s Gross Domestic Product (GDP) growth is expected to grow at which rate? 5. NRIs can exchange old 500 and 1,000 rupees notes at RBI offices till .........? 6. Who has won 2017 Brisbane women’s doubles title Brisbane International women’s doubles title? 7. Who was appointed head of Islamic Military Alliance to Fight Terrorism (IMAFT)? 8. Who was sworn in as new president of Ghana? 9. Who is the Prime Minister of Portugal ? 10. Who has won the Qatar Open tennis title?